Keraderm contains a mixture of high quality oils as a source of unsaturated omega-3 und omega-6 fatty acids as well as phytosterols. Keraderm supplies horses with biotin, zinc, organically bound manganese and the sulphur-containing amino acid methionine. These nutrients stimulate the horse’s epithelium and horn metabolism and provide nutrition for the skin, hair and horn structures. Vitamin E and ß-carotene enhance the immune system through their anti-oxidant effect. 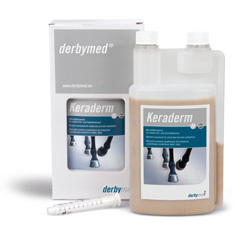 Keraderm can be given with the feed or use the enclosed pipette.